There is a desire among larger organisations and, in many cases, a mandate to move to the use of commodity cloud services. This enables organisations to reap the benefits of resilience, cost and even security. 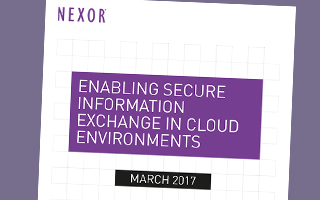 Nexor can work alongside you to integrate the Cloud into high assurance information architectures. We will set up a secure information exchange that ensures that your organisation’s Cloud-hosted data is fully protected at all times. According to Gartner, “if best practices are followed, they [public clouds] can be more secure than those in traditional data centers”. Nexor specialises in working with organisations that need to manage cross-domain information exchange to ensure that the best practices for cloud integration are adhered to. The key to success is taking a holistic view of the problem. Cloud integration brings a new set of challenges that differ from traditional data centres. We are equipped to help you deal with these challenges in a business context, with robust development and operational processes. The most important challenge that Nexor will address for you is ensuring that your business is fully secure and protected even though someone else is running the underlying cloud infrastructure. The desire to use the Cloud as a platform for secure information exchange is driven by the low cost and high availability benefits that it brings. At Nexor, we combine our CyberShield Secure services with architectural patterns from the National Cyber Security Centre (NCSC) (formally known as CESG), the UK National Technical Authority, built into our Secure Information eXchange Architecture (SIXA). This provides solutions that allow data to be shared in an environment that enhances the security of that offered by on premise solutions, using models that can be assured. Monitoring the solution closely to detect any foul play, using the Cloud’s resilience features to perform a “reset”, to reduce the “persistence” element of advanced persistent threats (APTs). By using Nexor’s expertise, organisations with a need for high assurance can bring the Cloud into their information architectures safely. This allows them to reduce costs and gain greater operational flexibility without compromising their information security. As Gartner identified, “the automation and programmatic infrastructure … can significantly improve the security protection of public cloud workloads”. By adopting Nexor’s unique SIXA solution, our customers can rest assured that the cross domain architectural approach provides a robust security solution, as it is built on architectural models from the UK’s National Technical Authority. Our robust procedural approach to implementing automated and programmatic solutions, delivered by our CyberShield Secure Services, ensures customers can trust that their data is secure.